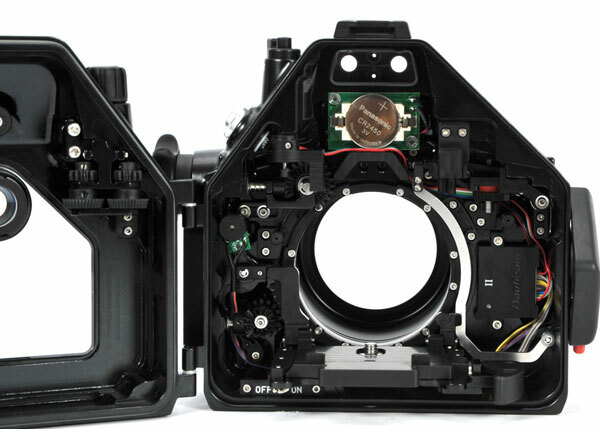 Nauticam has announced their housing for the Olympus OM-D E-M5 II mirrorless interchangeable lens camera. The Olympus E-M5 II mirrorless camera follows on the heals of the popular E-M5 but with some more robust features that are sure to be popular with underwater photographers and video shooters. Capable of shooting full HD 1080p video at 60 frames per second, digital video fans can now create smooth slow motion scenes with with E-M5 II. 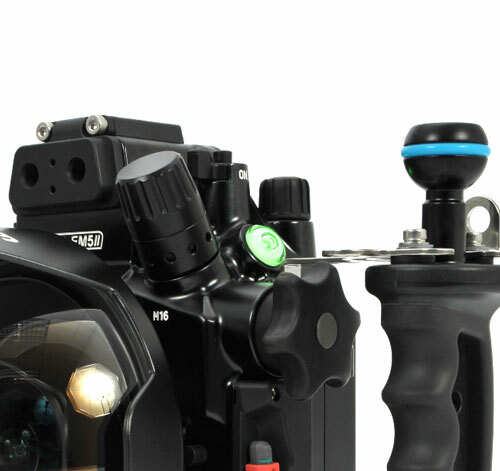 The camera body is also tougher and more rubust, with more buttons that can be customized for best use (and personal configuration) with your housing. Be sure to read our Olympus OM-D E-M5 II Camera Review. 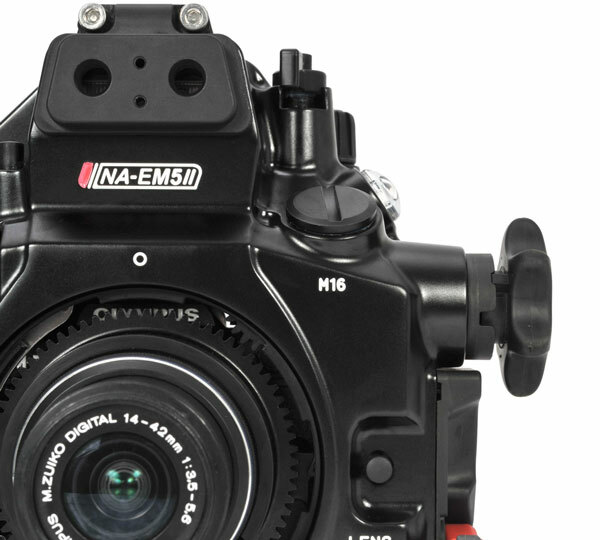 The Nauticam E-M5 II housing pulls out all the stops, incorporating Nauticam's most innovative design ideas in a compact and lightweight housing. The handles and tray are configurable, meaning you can choose the distance from handle to housing based on hands and finger size, or even skip the right handle entirely for handstrap use, resulting in a very compact setup. 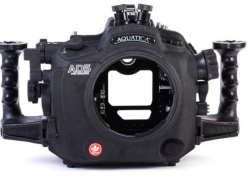 The housing also works with a number of Nauticam accessories, as outlined in the release below. Olympus made waves with the original E-M5, and the story continues with this new version. 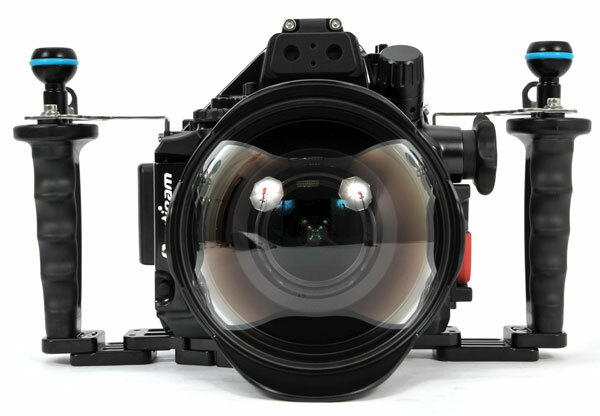 The camera has refinements large and small, from an additional stop of performance of the 5 axis stabilization to a fully articulated LCD; the "II" is an impressive update. Little touches include a lockable mode dial and two additional programmable buttons. Olympus clearly listened to users when it made the Super Control Panel on by default (no more hunting in the menu to try to enable this). The camera also now allows the info screens to be customized, such as the histogram, level and highlight/shadow warnings that can be shown together. Long exposure fans will like the LiveTime feature - realtime long exposure shooting - very cool. 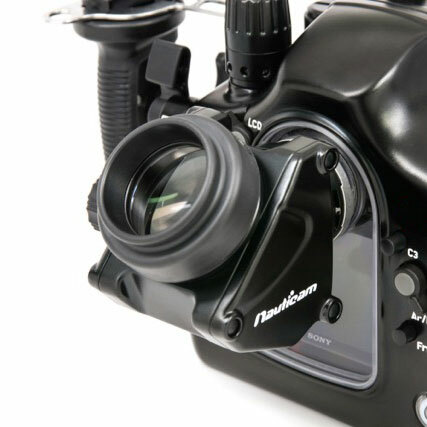 The new housing from Nauticam is an evolutionary marvel. This housing is true to it's NA-EM5 predecessor: highly configurable with the separate handle design (see CFWA Monster, below). This design allows the user to configure handles independently. One very desirable mode is to outfit the housing with a single left handle (Flexitray or Easitray), accompanied by a handstrap on the right. 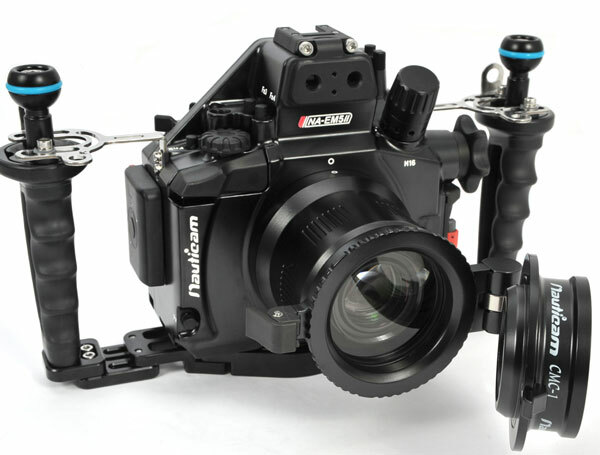 This helps to make rig as small as possible, with the comfort and security of the handstrap. Two handle options are available, as well as going as small as possible, with no handles or trays, ideal for the freediver shooting ambient light, for example. The NA-EM5II is designed by photographers for photographers. Look no further for state of the art. 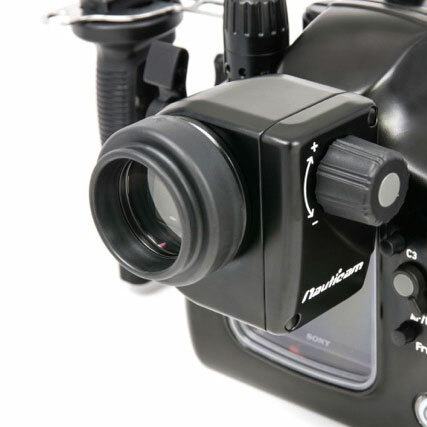 Circuitry included as standard equipment provides constant monitoring of water tight integrity when combined with an optional Nauticam M16 Vacuum Valve (PN 25612). 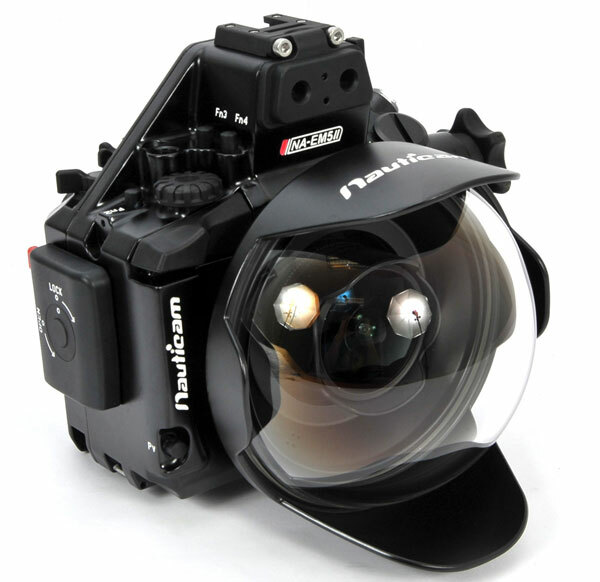 The range of Nauticam accessories is unmatched, with multiple accessories available to customize the system to individual needs. 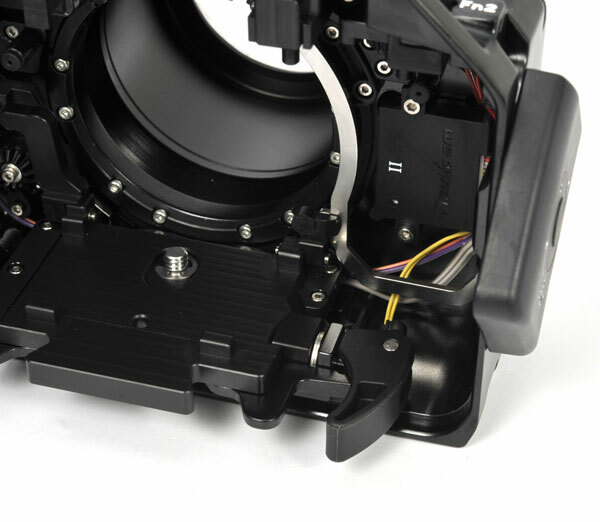 A variety of lens ports support all popular lenses. Accessory macro lenses, like the revolutionary Compact Macro Converter (PN 81301), attached with an easy to use flip holder are available for super macro photography. Stiffening handle brakets are included with the housing, providing a solid "wobble free" attachment when using Nauticam Flexitray (PN 71207) and Easitray (PN 71206) with heavy lighting systems. 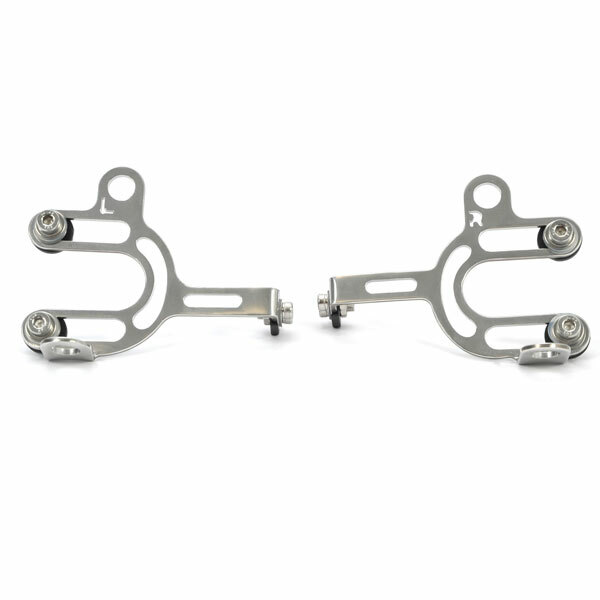 Multiple lanyard attachment points are included in the brackets. 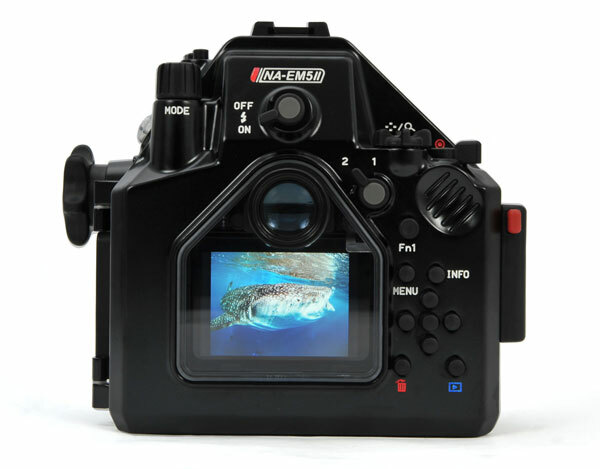 A clear view for fine focus and composition is critical for successful underwater photography, and nothing beats a magnifying viewfinder. These viewfinders use distance, not closeup vision, and provide a large, clear view of the high resolution Olympus electronic viewfinder. Available in Angled 45º and Straight formats, both viewfinders have external dioptric adjustments for dialing in perfect correction matched to the photographer's eyesight. 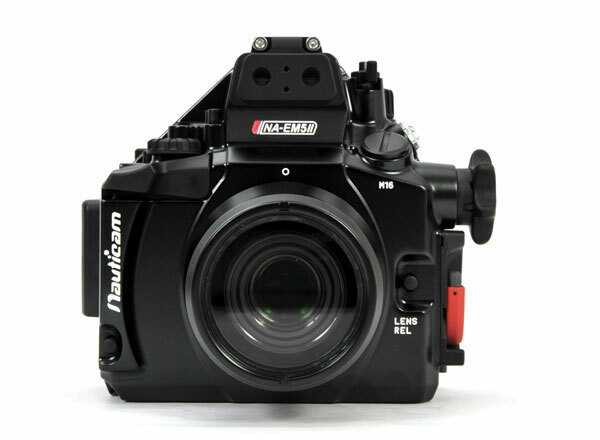 Reliable automatic flash exposure is available with the NA-EM10 and a variety of optically fired flashes. The Inon Z-240, D-2000, S-2000 strobes provide automated lighting, precisely reproducing the camera’s onboard flash at a proportionally greater intensity. This system yields accurate automatic TTL flash performance – even in manual mode - with no electrical sync cables to flood! The NA-EM10 comes fiber optic ready and accepts standard Sea & Sea style bushing connections. Nauticam Fiber Optic cables, available for both Inon and Sea & Sea strobes, provide the best light transmission and therefore more accurate TTL of any fiber optic cable on the market.